Grammar, punctuation and spelling are some of the building blocks of good writing. Your child’s writing, including their use of grammar, punctuation and spelling, is assessed throughout the year by their teacher. These three essential areas are also formally tested in a separate SATs test in May of Year 6. This SATs test is known as the SPaG test. SPaG is an informal term that means spelling, punctuation and grammar. When people refer to the SPaG test, they are actually talking about two tests that Year 6 children sit in May: one 45 minute test on grammar and punctuation, and one 15 minute test on spelling. Year 2 children have an similar, shorter test checking spelling, grammar and punctuation, but schools can choose whether or not to use it, and if they do, it is marked by the teachers. Why is the SPaG test necessary? Without a shared understanding of these terms, precise feedback like this would be difficult, if not impossible. Testing a child’s understanding of these words helps to reinforce their knowledge. Try not to be put off by complicated terminology! We all use adverbials, prepositions, pronouns, and so on, even if we don’t know what they are called. It could be helpful to encourage your child to tell you about some of these terms, and this jargon buster is a good source of information too. Confidence in spelling, meanwhile, helps children to communicate ideas quickly and clearly; if they have to think a lot about spellings, they will forget their ideas! And sometimes, children avoid using really effective words because they aren’t sure how to spell them. What parts of the SPaG test do children find hardest? More than anything we would recommend lots of reading (and being read to by parents/carers, or audio books) as many grammar questions may be answered by asking the question, “What sounds right here?”. To know what sounds right, your child needs to have heard lots of good written language, and this sense of what is right will come from experience with high-quality texts. Reading widely and noticing things like punctuation and spelling is useful too – if you’re reading with your child, try to show enthusiasm for these things, too. Reassure your child that no-one can memorise every word that exists. A key skill is to hear a word and then break it down into its syllables (ad-vent-ur-ous). Then they can try to spell each syllable in turn. You can find lots of grammar activities on the internet for additional support (for example, take a look at this grammar, punctuation and spelling made easy page), and we heartily recommend having the Oxford School Grammar, Punctuation and Spelling Dictionary to hand as a quick reference tool. If your child is given work to do at home to prepare, try to make the sessions as fun and positive as possible. Covering fewer things in small chunks and returning to them more than once will help your child remember their learning. Giving your child frequent breaks, including fresh air and some form of exercise, will also help the learning process. For fun grammar activities and games, why not take a look at this Kids’ activities page? Keep in mind that the most important aspect of learning that can happen at home is sleep. No learning can happen at all without it, and a child sleeping 8–9 hours a night will remember more than a child sleeping less. 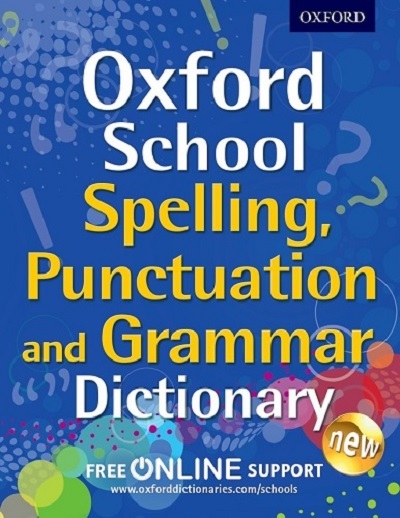 With a clear, colour layout to make it easy to navigate, this book is a valuable resource for grammar, spelling and punctuation-based exam preparation. It is user-friendly and encourages pupils to correct their own spellings and improve their spelling techniques and grammar. The accessible format provides an invaluable quick guide for children and parents alike. 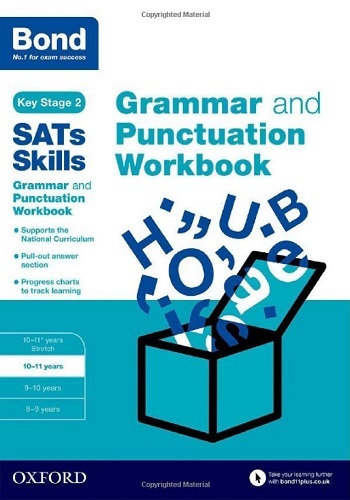 Bond SATs Skills: Grammar and Punctuation Workbook: 10–11 years builds and extends grammar knowledge in preparation for the Key Stage 2 SATs English grammar, punctuation and spelling test. 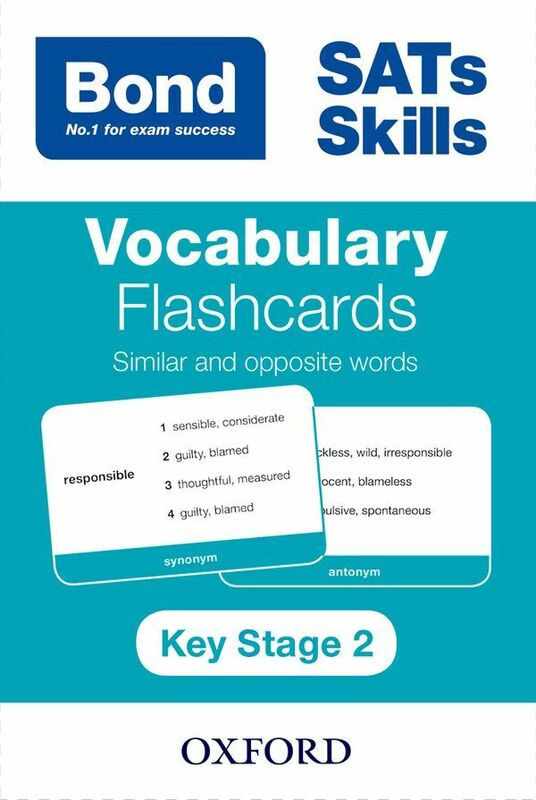 Comes with essential information on grammar and punctuation to support children and parents, as well as quick quizzes at key points to recap on what has been learned in previous units. 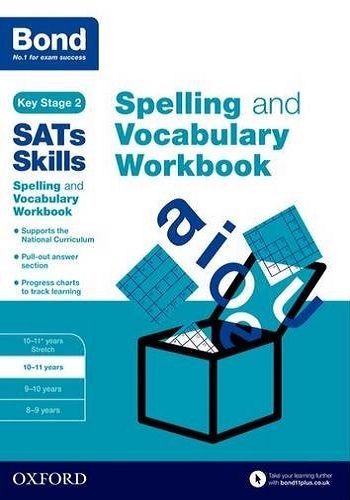 Bond SATs Skills Spelling and Vocabulary Workbook: 10–11 years has been developed to build core English language skills. With renewed focus on spelling and vocabulary throughout the National Curriculum, this book will help children establish the knowledge needed in key assessments. Christine and Lindsay were Leading Teachers for their respective Local Authorities before becoming LA consultants and then independent advisors, working to support Primary English and curriculum development nationally. They are also a married couple, so they never, ever stop working.